Did you know The Fantasy Man is a die-hard softball playing extraordinaire? That's right! Below is a picture of the 2009 Putnam Valley, NY Softball Fall League Champs! 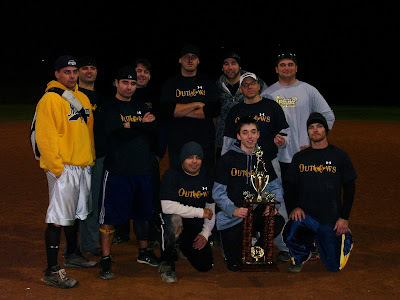 We played this league well into mid november as this picture was taken after Game 3 and the final deciding game of the championship (we also won the 2009 Cortlandt Manor Men's "Upper B" Summer League Championshop). I believe we won the game 21-20. I was the pitcher and we went into the bottom of the 7th with a 21-15 lead. Leave it up to The Fantasy Man to get the first two outs, walk two guys, base hit scored two, two more walks, and then a 275 foot bomb over the centerfield fence. Ten seconds later I got man on first and second, ready to blow the game, full count and I dance a knuckle ball on the outside corner that the hitter tried to pull, bounce a slow roller to me and I throw him out at first...... the Outlaws win the championship! It was 25 degrees that night five days before Thanksgiving! What a season! That's right, that's J2 from the video. Anyway, one of the softball bats we used during our winning season was a DeMarini White Steel. This bat is awesome! I'm a 34"/26oz guy but this was the team bat for a while. The break in period was short and the bat was surprisingly durable, even in the colder weather. CheapBats.com offers baseball bats, softball bats, apparel, training aids, etc. The prices are good, the shipping is fast and the customer service is fantastic! I've used CheapBats.com in the past and I'd recommend it to anyone who needs baseball and/or softball equipment!